"LG has gone on record saying that Windows Phone 7 hasn't performed as well as it thought it would, following the launch of the mobile OS in October. "From an industry perspective we had a high expectation, but from a consumer point of view the visibility is less than we expected", James Choi, marketing strategy and planning team director of LG Electronics global told Pocket-lint in a one-to-one interview." Much has been made about this in the blogosphere, but I think if you cut through the fluff you get to a couple of key points: one, that LG was hoping for more "visibility". I think that means advertising and promotions - a bigger bang in the market. I can't speak for other places in the world, but in Canada I don't think I've seen a single TV ad for Windows Phone 7 on a Canadian wireless network. What I've seen instead is a steady stream of promotions on US TV networks - so some promotion is clearly being done. The other comment from the LG representative is related to the minimum hardware spec for the phone; he feels that a lowered hardware spec would result in more sales. I'm not sure that's the case - although there's supposed to be an HVGA (480 x 320) option in the pipeline, will lower-resolution phones really be what drives sales? I tend to think better-designed phones will do that - and that's in LG's court. One of the comments on the PocketLint article also made a lot of sense: none of LG's Windows Phone 7 devices are available on his carrier, and he's not going to switch carriers just to get an LG phone. What about you? 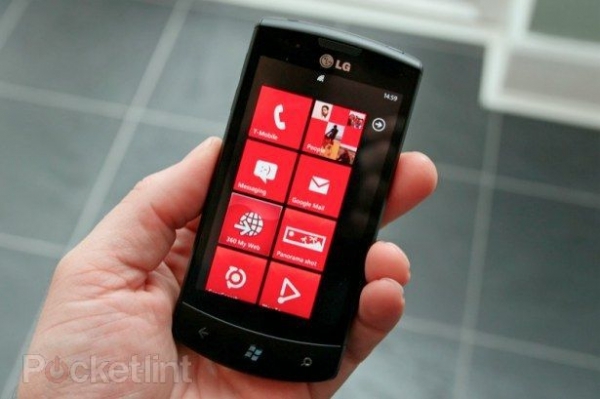 Do you have easy access to an LG Windows Phone 7 device, or would you have to switch carriers to get one? a) Specs too high -- LG thinks that lowered specs would have enabled them to produce a cheaper phone which MAY have gained greater acceptance / sales upon launch. Most of WP7 phones were pretty expensive if you weren't looking to renew / start a new contract. No contract costs were around the $600 mark which would definitely turn off a large portion of the consumer market. That said however, to run the WP7 O/S with a reasonable 'feel' (both my sons have remarked how 'smooth' WP7 is compared with Android or WM6.5) you need some pretty hefty power. b) Lack of carriers -- as Jason mentioned, there was quite a bit of market play from the US, but very little here in Canada. From LG's perspective, the US is probably the big market anyway but yes, I had to go to eBay to get an LG phone here in Canada, then unlock it. Bell and Telus seem to have accepted the Smartphone revolution as the future and plunged in, Rogers seems to be still dipping their feet in the water since they have only one high-end smartphone (the Samsung Focus). Even their Android offering (the X10) is now dying with a 2.1 version as the last upgrade. I think LG has a point. Inexpensive has a solid place in the WP7 market. Microsoft have made it very clear that they are after the large group of people who are switching from feature phones to smartphones. These people have always bought the cheapest, or free phones, available from their carrier, coupled with inexpensive monthly plans. I can't believe how many people from the "text-generation" I see using Blackberrys. I think if WP7 put out a device with a small screen, and front facing keyboard, with low memory and a memory card slot so they could choose the memory they want at the price they want to pay, at a very low price it would do very well. I think the key is in keeping the cost low, so that the cost to the carrier of subsidizing would be much lower. This way they could offer very low end monthly plans and not have the burden of clawing back more money with higher rate plans. With higher subsidies and higher rate plans the money really ends up in the hands of the OEMs. The OEMs would be looking at less profit per device, but they could then easily be looking at 10s of millions of devices, not millions. This still leaves a place for the mid to high end range devices WP7 has now and room for more higher end devices as well. Last edited by Paragon; 01-18-2011 at 02:15 AM..
After using a pirated WP7 ROM on a HTC HD2, I cannot see how WP7 will work with lowered requirements. To change the hardware formula to a lesser one would be bad news. Funnily enough, the Optimus 7 is one of the cheaper phones here. Not that it is any worse, and Microsoft has been advertising plenty here. Maybe LG should step up on their own promotion? They've constantly lagged behind Samsung and HTC (yes, HTC, the once ODM) in their own marketing. A t first sight WP7 has a huge "Wow" effect but personally, after using a HD7 for two months, I am getting more and more frustrated both with minor and major shortcomings. MS really needs to deliver updates as fast as possible. And do not forget that Intel has already said that they will Windows 8 on Smartphones and this is a move that could kill both WP7 and Android in one shot. There isn't a single model of Windows Phone 7 I can't find for free on a US carrier. Don't know how you can get cheaper than that. Maybe the non-contract prices can turn you off, but that is true of any 'smartphone' unless you are looking for cheap. I didn't say inexpensive either, I said cheap. This phone isn't really targetted at the segment that will actually pay full price for a non-contract phone, or be gaga enough to pay that out of cycle and with an ETF. Yea that limits you to 'normal' folks whose contracts are up, are looking at smarter phones than they have, or can hand one down in a family plan. OK, that's life. Each of the US launch partners picked a feature to differentiate themselves. Maybe LG overestimated the desire for a hardware keyboard, which generally makes the device more bulky. Maybe LG isn't as well known for phones as Samsung and HTC. Personally when you say LG to me I think refrigerator. Maybe they would have done better on T-Mobile only competing with one other model instead of two. Who knows, but I don't think it is systemically a Windows Phone 7 issue. BTW, free isn't really a good thing either. Just makes the detractors say, they can't sell them, so they are giving them away. There isn't a single model of Windows Phone 7 I can't find for free on a US carrier. Don't know how you can get cheaper than that. "I think the key is in keeping the cost low, so that the cost to the carrier of subsidizing would be much lower. This way they could offer very low end monthly plans and not have the burden of clawing back more money with higher rate plans. With higher subsidies and higher rate plans the money really ends up in the hands of the OEMs. The OEMs would be looking at less profit per device, but they could then easily be looking at 10s of millions of devices, not millions"
That would be such a hugely stupid move, I can't even put it into words. The *last* thing anyone wants to be doing with their phone is running Windows Update and waiting for their phone to reboot. Seriously, a desktop OS on a tablet is bad enough. On a PHONE? Unmitigated disaster. This way they could offer very low end monthly plans and not have the burden of clawing back more money with higher rate plans. Have you seen any carrier offer a low data rate plan lately? The costs are going one way: up. Even if they sold cheaper devices, I don't see them reversing the course. Maybe you prefer to wait for OEM and Carriers to deliver your updates; I would rather prefer to use "Microsoft update". As for the second part of your post I was around when people where saying the same thing about calendars, emails etc. on a phone and the general consensus was that having two separate devices was better. And about the "Desktop OS on a Tablet" I wonder what do you consider a "Tablet": I replaced my laptop with a Tablet in 2001 and never missed the former. All these so called "Tablet" like the iPad and Samsung clones are not real computers and cannot do what my Tablet does. The marketing department is free to call them as they like but they are nothing else than "Smart Display" updated to 2010 technology. Time will tell if you or Paul Otellini are right but being someone who has been using a "Primordial" PDA since 1982 I am used to hear people making these kind of comments about future scenarios. Last edited by Fritzly; 01-18-2011 at 09:16 PM..